If you experience chronic swelling or tingling in your limbs, or if you are confined to your bed for most of the day, there is a good chance your life could be improved with the use of compression therapy. Whether you are preventing deep vein thrombosis (DVT), applying gradient pressure to circulate blood flow, or reducing limb swelling through active pump pressure, compression therapy has a wide range of uses and applications. Once you find the right therapy, you will be well on your way to going about your day much more comfortably. Do you worry about varicose veins, swelling in the legs, tingling? These mild symptoms could be treated with a light compression stocking. If you have severe swelling, poor circulation and fluid build-up, you will want to look for a stronger compression stocking and possibly a compression pump. To eliminate or prevent swelling and discomfort you may want to take advantage of our wide selection of graduated compression stockings, like the casual VENOSHEER. If it's more intensive therapy that you are looking for, you will probably want something like the Huntleigh Flowtron Hydroven 3 Lymphedema Pump. If you need a more intensive therapy that requires a compression pump, it is a good idea to consult your doctor, as these medical devices require a prescription. Compression garments are designed to look like regular clothing, so that you can comfortably wear them throughout the day. You could choose a few different styles and colors, so that you have a compression option for every outfit. Compression socks are available in knee high, thigh high, sheer, opaque and even athletic socks. There is an option for everyone. There are several different levels of compression to suit your specific needs. For example, if all you need is a light level of compression to help with mild symptoms of vein disease, or something to energize and stimulate tired legs and feet, and improve circulation, you probably want to go with a lighter degree of compression such as 8-15mmhg. Conversely, if you need a stronger degree of compression that will treat severe symptoms, you'll want to go for a much stronger degree of compression such as the 30-40 mmHg. There are certainly many degrees in-between as well, so if you are unsure of how much compression you need, make sure to check with your primary care physician. What Style Is Best Suited for You? 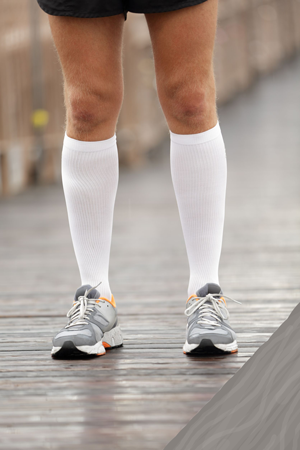 When choosing a compression stocking, take into consideration your level of activity and lifestyle. In other words, if your doctor has recommended purchasig compression stockings to assist with recovery while in bed, then the ideal choice would be an anti-embolism stocking. An example of an anti-embolism stocking is Covidien's Beige TED Hose Knee High Stockings. Swelling caused by a pregnancy can be treated using several brands of maternity stockings designed for comfort and care. Another option is purchasing compression socks for athletic purposes. There are several different styles to choose from, including ski socks, running socks, golf socks, as well as compression sleeves. If you want a less specific, more versatile sock, try CEP Progressive Teamsports Athletic Socks. You will also find that many compression stockings are designed to match your daily wardrobe. If you are purchasing compression socks to prevent everyday leg fatigue or want to prevent swelling, there are several stylish compression stockings for women that look similar to normal dressy stockings. There are also many compression stockings for men that fit discreetly under a pair of pants and casual-looking knee-high compression socks for both men and women. Not Just for the Legs! Lymphedema or swelling can occur in your arms as well, and in that case, you may want an arm sleeve or gauntlet, which come in a variety of designs and color variations. Check out the stylish Sunburst Compression Arm Sleeve by LympheDivas, for example. In the end, it is very important to get the right fit to get the most out of your compression therapy hosiery. If you are unsure what size you might need, we have several sizing charts to help you narrow it down. Some people may need a more concentrated, home-based therapy. In such a case, you're probably shopping for a compression pump. These specially designed pumps help prevent deep vein thrombosis, help with circulating blood flow, as well as reducing the swelling of legs or arms through active pump pressure. Pumps operate through use of a sequential compression technique that mimics the body's lymphatic system by moving lymphatic fluid through the body via a multi-chamber pump system. Some pumps come equipped with alternating pressure, such as the CircuFlow 5200 Multi Chamber Compression Pump with Two Mode Selections, which are particularly beneficial for individuals with excess edema or brawny tissue. When shopping for a compression pump, there are many important factors to consider, such as pressure, cycle and sleeves. Choosing the right sleeves is very important to ensure the best treatment. Furthermore, some pumps have a bilateral compression feature, which allows two people to use the same pump at the same time, such as the CircuFlow 5150 Intermittent Pneumatic Compression Pump. Bilateral pumps are also great for decongesting certain vital areas, like the arms or pelvis. In order to get the most value out of your compression therapy, we recommend making a well-informed purchase. So whether you are purchasing a compression therapy option to relieve swelling, improve blood flow, or decrease the symptoms of venostasis ulcers and stasis dermatitis, make sure your doctor gives you all the information you need before you start shopping at Vitality Medical.